Guessing t-shirt quantities can be scary, especially if this is your first time. It would be great if you knew ahead of time exactly who’s attending, who gets a shirt and what size they need. But this is the real world and we don’t have the info up front. Don’t worry. With a little thought, you can eliminate much of the guessing and ensure t-shirt order bliss. Start with the number of shirts. Do you need 25 shirts or 350 shirts? Depending on your situation you may know exactly how many shirts you need or you may need to make a good estimate. Lets say you decide on 42 shirts. That’s good for now. On to step 2. Check the quantity discounts. Ministry Gear has price breaks at 25, 50, 75, 100, etc… sometimes ordering more shirts can actually save you money – or at least lower the price enough that you can buy extra shirts. This also gives you a margin of error. In this example, it saves you money to order 50 shirts rather than 42. Effectively giving us 8 extra shirts for free. Okay, so lets order 50 shirts. 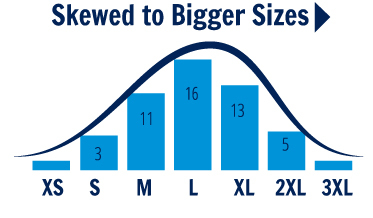 What’s the most popular size shirt? The answer to this question depends on your group. Are they kids, adults, teens, or a mix? If you wear a Medium, don’t fall into the trap of thinking that it’s the most common size. Usually the most common size in groups with all adults is Large. But use your judgement. It can vary based or region or the mix of men vs. women. 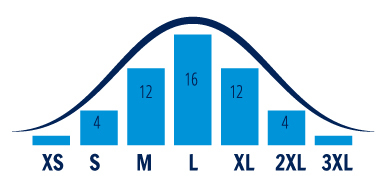 In this example, we’ll use 50 shirts with size Large as the most common size. Make a “Bell Curve.” What? Statistics!! Don’t worry, you don’t even need a calculator. Start with about 1/3 of your total for the most common size. We’ll start with 16 Large. Then on either side of that, add a few less Mediums and XLs with 12 each. Then going out further on the curve, we’ll choose 4 Small, and 4 XXL. Lastly, we’ll choose 1 XS, and 1 XXXL. Now you can see how this forms a curve. Want added Insurance? We can skew the sizes slightly to the bigger sizes since it’s easier to fit someone in a larger shirt than it is to fit someone is a smaller shirt. Final Adjustments. Once you’ve got the sizes distributed, it’s smart to make some little adjustments based on things you know about your group. Make sure you get a 4XL for Big Joe, and Missy’s little girl gets a Youth Small.